WASHINGTON COUNTY — Four separate rescues in 24 hours kept Washington County Search and Rescue teams busy, starting with a pelvic fracture Saturday afternoon and ending with two wrist fractures on an 11-year-old tourist on the first day of her family vacation. The first rescue began at 2 p.m. Saturday when a man called 911 reporting a motorcycle crash in the area of Sand Mountain, Washington County Search and Rescue Liaison Darrell Cashin said. 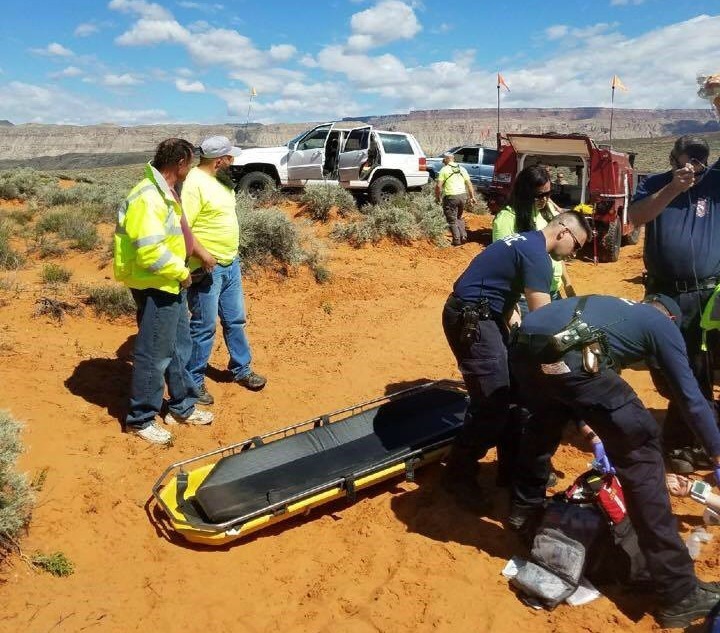 Two rescue teams were sent to search for the injured 27-year-old rider, along with Hurricane Valley EMS and Utah State Parks personnel, Cashin said. Once located EMS personnel treated the injured rider who appeared to have “possibly sustained a pelvic fracture,” the deputy said, and was unable to move and in a great deal of pain. The man was riding on a dirt road just east of Sand Mountain, and crashed after losing control of his motorcycle, he said, while a family member called 911. Hurricane EMTs drove the man to a waiting ambulance that transported him to Dixie Regional Medical Center for treatment. 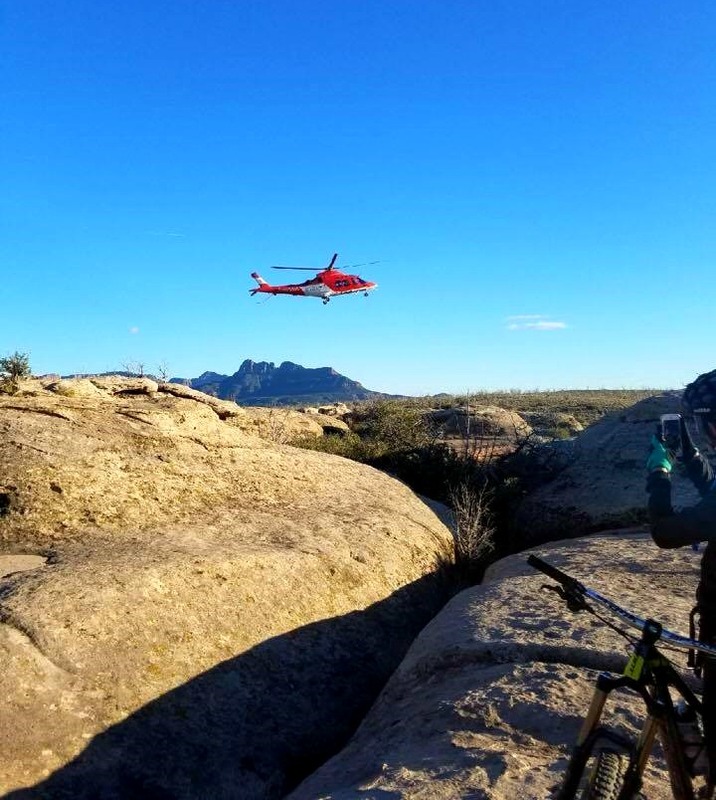 Just as emergency personnel were returning from the first rescue another call came in reporting that a 66-year-old man crashed while riding his mountain bike on Guacamole Trail, Cashin said, and injured his knee to the point that he was no longer able to continue. Two teams from the Washington County Search and Rescue, along with officers from the Bureau of Land Management and Hurricane Valley Fire and EMS started out to locate the injured rider. As rescuers were making their way to the area the injured man called into dispatch and asked if a helicopter could be launched to transport him to the hospital. Within minutes Intermountain Healthcare’s Life Flight was dispatched to the area as well. The ground team reached the man and were assessing his injuries when the rider told them that he thought he tore a ligament or suffered a knee fracture in the crash. While EMT’s initiated treatment a landing zone was set up for the air transport, Cashin said, and once Life Flight landed the rider was transported to Dixie Regional Medical Center for evaluation. “The main reason he was transported by air was due to the remote location he was in, so a ground transport would have been very difficult,” Cashin said. Meanwhile, another call was received at the St. George Communications Center from a man reporting that his Chevrolet Suburban became stuck in the mud hours earlier and that his 78-year-old mother was still inside of the vehicle, the deputy said. A Washington County Search and Rescue westbound team was dispatched to that call while the eastbound team continued the rescue of the mountain bike rider, Cashin said. The driver and his mother were traveling on General Steam Road near Veyo when the vehicle became stuck in more than 4-inches of mud, the deputy said. After the heavy rainfall days earlier, many of the roads were thick with mud and difficult to navigate. The driver had no cell service in that area and started hiking out towards Enterprise Reservoir, while his mother remained in the vehicle waiting for help. After walking nearly 8 miles, the man was picked up by a passerby who drove him the rest of the way to the reservoir, Cashin said. The rescue team located the stranded Suburban and found the woman still waiting inside. After checking on her condition, several rescuers took her to Enterprise Reservoir to pick up her son while rescuers stayed back to pull the vehicle from the mud and drive it to drier ground. Once the group returned to the SUV the driver told rescuers he was apprehensive about driving back to the reservoir because of the soggy road conditions, Cashin said, so one of the team members drove the Suburban, while the driver and his mother followed in the rescue vehicle. Once on drier ground the duo departed in their vehicle, uninjured and on their way home, the deputy said. 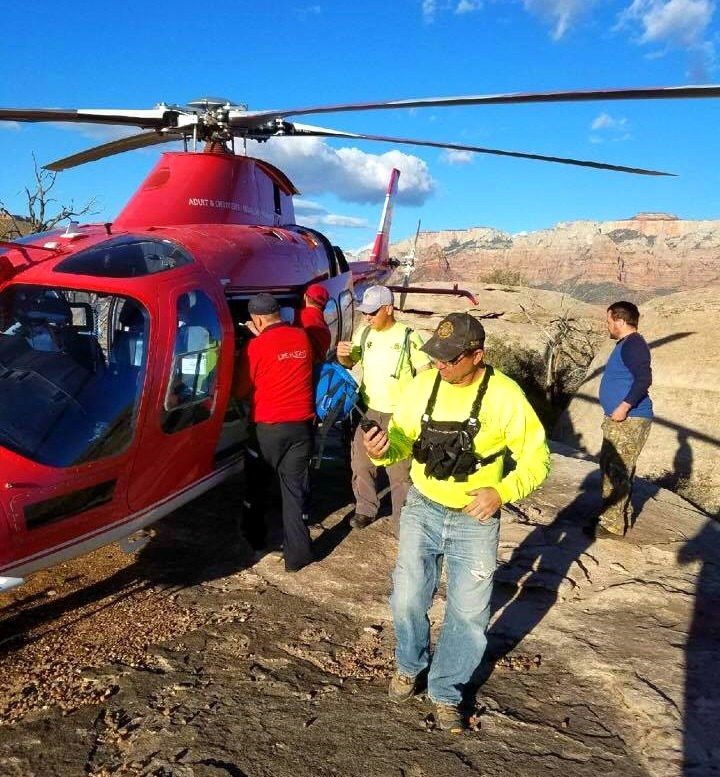 Shortly after 2 p.m. Sunday the search and rescue team was again called out, this time to an incident involving an 11-year-old girl who was injured after crashing her mountain bike on the Stucki Springs Trail located southwest of St. George in the Bearclaw Poppy reserve. The girl was riding with her parents while visiting St. George from Canada, Cashin said. The team, which comprised 10 rescue personnel including several advanced EMTs and a doctor, made their way to where the injured rider was located using GPS coordinates. However, the doctor set off on his mountain bike to reach the injured rider sooner. Upon arrival they found the girl awake and conscious, and the doctor determined that both wrists were fractured and that she sustained other minor injuries as well. The fractures were quickly splinted, and she was driven by rescuers to the incident command center set up on Navajo Road near Bloomington. A short time later the family was on their way to Dixie Regional Medical Center for treatment, Cashin said. Washington County Search and Rescue is composed of six teams that include an eastbound team, westbound team, a high angle team, swift water team, a dive team and a medical team. This structure also provides the best care for those rescued, he said, because there is basic and advanced EMT care, in addition to a doctor who either consults on a rescue or goes with the team. The Washington County Sheriff’s Office, Washington County Search and Rescue, Hurricane Valley Fire District and EMS, the Bureau of Land Management, Utah State Parks, Intermountain Life Flight, St. George Fire Department and Gold Cross Ambulance responded and assisted.